The towering green visage in Dr. Seuss’ immortal tale of “How The Grinch Stole Christmas” is as famous a holiday figure as Santa Clause or Jesus Christ, prevailing in our imaginations as a reminder of how even the coldest hearts can renewed by a sense of unconditional faith and joy. An abstract reconstruction of the typical Ebenezer Scrooge persona, so to speak, Seuss’ eccentric antagonist lives on year after year, high in the mountains, watching the “Whos” down in “Whoville” relishing in the spirit of the holidays by lighting up trees, putting decorated wreaths on door handles, and exchanging gifts as if participating in a large birthday party. The story itself isn't a terribly involved one, true, but is played out with such vivid integrity and respect that, even for those who identify with the Grinch's actions of attempting to prevent the holiday's occurrence, reading it leaves behind a heartwarming lesson. Though Seuss is no longer with us, his story is immortalized by perennial recognition, with parents reading the story to their children every Christmas Eve, and an animated special put on heavy rotation throughout the month of December. Because of such embracement, it was only a matter of time before the Grinch got an opportunity to be brought onto the big screen, utilizing the benefits of today's technology in live action filmmaking in order to realistically recreate the sharp, compelling landscapes of the author's memorable cartoon world. The only probing concern is that cinematic adaptations tend to unfairly alter their source material; sure, all stories can be successfully told in different tones, approaches or realizations, but at bare minimum, doesn't the basic moral structure deserve preservation here, if only because it's the first big screen treatment we've ever seen of this particular writer? People who feel this way will undoubtedly be left baffled by this long-anticipated film adaptation of the classic Christmas story, which is directed by Ron Howard, stars Jim Carrey, looks and feels like Dr. Seuss' work, but severely (and unwittingly) alters the very source material beyond a point of explanation. "How The Grinch Stole Christmas" was written in an innocent, pleasing tone that needed no probing insight to explain why people feel so coldly about holidays; in the movie, a back history of implausible proportions is created to justify the Grinch's bleak persona, and beyond it lies an endless display of toilet humor jokes, unfunny one-liners, and a Carrey performance that is so reminiscent of his "Ace Ventura" days that he practically evaporates on screen. The movie is not only disappointing, but badly miscalculated as well. Probably the biggest insult of all drastic changes in the ghastly inappropriate depiction of the Whos. These busy little beings, hurrying around in preparation for the oncoming holiday, were written in a mood that described them as innocents whose faith in the spirit of the holiday would overcome any obstacle (even that of losing every present, tree and light). In the movie, all of the busy beings (with the exception of one Cindy Lou Who) are portrayed as material-hungry shoppers who think the gift of the holidays lies in how much you spent at the nearest shopping center or how many decorations you've hung on the outside of your house. Without the broad and appropriate realization, how are we to expect (or believe) that the Grinch's heart could grow "three times as large" on Christmas?? If there were no back story behind the Grinch here, the materialism itself would be enough reason for the big green guy to tear away every trace of holiday cheer. Ron Howard is a hit-and-miss filmmaker with as many bad films to his name as good ones, and Jim Carrey steps into roles so diverse nowadays that its difficult to assume what tone is used in the performance. But at least they have tried to do something interesting with the Grinch story here instead of falling back on clichés and formulas. Even though the outcome is certain (one of the few gleaming qualities about the production), the roads toward a resolution are winding and adventurous, with a few surprises and detours along the way helping to at least keep the journey interesting. The most notable quality is that of the exterior design, which is shaped and sculpted so painstakingly to match the world Seuss created that we are left in awe. And of course, one cannot quibble about Carrey's highly-detailed transformation, either; he may not be the ideal role for the Grinch, but makeup and costumes have made him an uncanny replica. It's just the approach of certain important details that are questionable and unneeded; we don't want to know the reasons why the Grinch has generated such a strong hatred to Christmas, nor do we care. This isn't "A Christmas Carol." Save the background checks for a movie that deserves them. 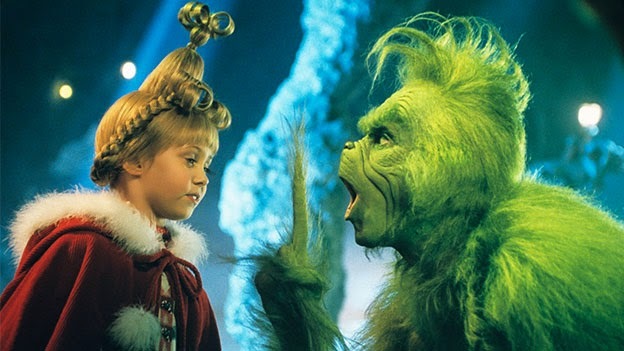 "How The Grinch Stole Christmas" is a peculiar and disconnected depiction of simple source material, disguised as a kid's movie but really meant for a public who has either never read the story or doesn't care how it is portrayed.